It has been a roller coaster ride for "The Man", as Becky Lynch is fresh off returning to the ring after suffering a concussion and "broken nose" at the hands of Nia Jax last November. Today, Becky Lynch received some terrific news that has her excited and happy about her fan base. Becky Lynch is the current SmackDown Live Women's Champion, having won the title from Charlotte Flair last October at "Hell in a Cell". 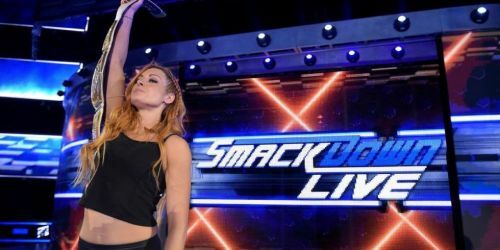 She made her return a couple weeks ago (officially) to answer the challenge laid down by SmackDown Live General Manager Paige. We will be seeing Becky Lynch defend her SmackDown Live Women's Championship against both Charlotte Flair and Asuka in a "Triple Threat TLC Match" at "WWE TLC", which is less than two weeks away. Becky received news from WWE today that her Royal Rumble VIP Axxess had SOLD OUT in a matter of 90 seconds! That is pretty cool, as it shows how dedicated her fan base is to her character, and how far she has come in the last five months following her dramatic character evolution since SummerSlam. As noted above, Becky Lynch will be facing Charlotte Flair and Asuka in less than two weeks at WWE TLC in a Triple Threat TLC Match for her SmackDown Live Women's Championship on December 16. Beyond this match, there has been much speculation as to how Becky Lynch would be used beyond TLC heading into the Road to WrestleMania. One theory being the showdown between her and Ronda Rousey that was promised for Survivor Series, but cancelled due to her injuries. This would be one of the headlining match-ups for WrestleMania 34 if this were to come to fruition. How do you see Becky Lynch being booked heading into the Road to WrestleMania? Let us know in the comments below.